Micromax has finally launched what we expected Micromax Canvas 4 (Full Review) to be in the first place. A Mediatek MT6589T device with Full HD display and 2 GB RAM. Though late, but the Micromax Canvas Turbo has arrived and it has arrived in style, with none other than Hugh Jackman promoting it! Let’s take a look at what Micromax is offering with its New Flagship Aluminium body Smartphone. The camera features remain similar to Micromax Canvas 4 and you will get an Auto Focus 13 MP camera with LED flash and 5 MP camera. So is it same as what every other MT6589T phone is offering? The answer is No. Micromax Canvas 4 came with Vertical Panorama which allowed you to shoot tall buildings, and Micromax Canvas Turbo has come with three special features. The Cinemagraph mode lets you capture a video and create a gif by animating any object by highlighting it. The 360 degree panorama mode lets you capture a holistic view by taking several shots and interweaving them and at last the Object Eraser is the HTC One Zoe like object removal tool. You can see all of these features at action in the short videos at the end of this review. The internal storage is 16 GB which unfortunately is not extendable. Out of this only 1 GB will be available for Apps and 12.47 GB will be for user data. You can use the data storage part in memory also for storing apps. This is a limitation of this smartphone as other rivals like Gionee Elife E6 and Intex Aqua i7 are offering 32 GB non expendable storage. The Processor is powered by MT6589T chipset with a quad core processor clocked at 1.5 GHz and backed by 2GB RAM. The chipset also houses PowerVR SGX544 MP GPU which is clocked at highest frequency among other MT6589 SoCs at 357 MHz. This chipset coupled with stock android is expected to give better performance while playing games and watching high definition videos. The Battery capacity is 2000 mAh which is again little disappointing. Micromax claims that this battery will provide you with 7 hours of talk time and 105 hours of standby time which is not much considering the power hungry full HD display and quad core processor. Micromax could have gained a solid edge over the competition by providing some extra battery capacity which unfortunately none MT6589T phone is offering. The display as mentioned is a 5 inch display with power saving Continuous grain silicon and is similar to other canvas series devices and also similar to Intex Aqua i7 and Gionee Elife E6 in terms of display size and resolution. The 1920 x 1080 p full HD display with 16.7 M colors instead of 16 M which we have seen in Canvas phones so far will give you visible improvement in quality. The phone comes with Dual SIM functionality. One Micro SIM and one normal size SIM card can be pushed in this device. On the software front this phone comes with Android 4.2 and pre installed apps like BBM and Hike Messenger. All the software features we saw in Canvas 4 like Blow Air to Unlock, easy answer, and other gesture features are also available in this phone. Various minor features like iFloat and Multi Video Views have also been added for efficient multitasking. The phone is quite sleek at 8.66 mm and sports a Aluminium body design which Micromax states will double up as body antenna to improve signal strength and has been rounded off using over 100 finishing processes. The phone does look attractive in the pictures. This phone has been priced judiciously and will give stiff competition to other MT6589T Phones like Gionee Elife E6 and Intex Aqua i7. It will also be a preferable option for many people, against similarly priced phones like Micromax Canvas 4, LG Optimus Pro Lite and Lenovo P780. 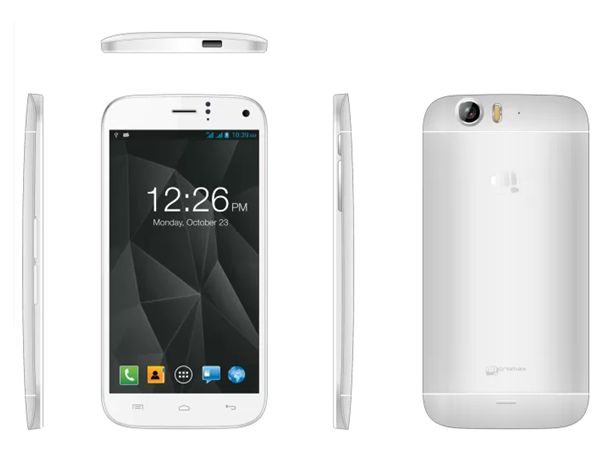 Those looking for MT6589T performance at a still lesser price can consider Micromax Canvas Magnus. Micromax launched Micromax Canvas Magnus yesterday which is competitively priced and offers MT6589T chipset at 15,000 INR. Micromax Canvas Turbo is also priced competitively and we can expect the price of phones like Gionee Elife E6 and Intex Aqua i7 to slide in the coming time. The specifications are similar but a few software tweaks and intelligent marketing has successfully grabbed attention. The major limitation is the battery capacity.